Atlanta is sort of an odd city – kind of a cultural oasis in the northern section of the sovereign state of Georgia, whose escutcheon not too long ago appeared to be crossed axe-handle and chicken wing on a field of rampant poverty. Some of that has changed these days, but the poverty and general depression remain in the country and even in selected areas of the city itself. Culture is there to be sure, but that which is visible is all bleached – black culture is so underground as to be subterranean. Blues artists have and do abound in this city, and it has been the home-base tor Frank Edwards for quite a long time. Frank, a performer known to knowledgeable collectors, made one session for OKeh before the war and cropped up again on a session done for a Linden, N.J. concern. Not exactly an overexposed blues artist, but one who seemed to have an unique style – he was remembered over the years to researchers who were active in the Atlanta area. “He’s a Muslim, and won’t play no more”; “He can only play ‘Little School Girl’”; “He’s got funny ‘time’ and can’t nobody play with him” were some of the comments heard. He was, obviously, “rediscovered”, and something was learned about the man and his music. The man was born in Washington, Georgia on March 20, 1909, and his family moved from there when he was fairly young to St. Petersburg, Florida. His interest in guitar was life-long, although not at all encouraged by his family – he got into trouble with his father for buying his first guitar! Frank’s style is his own, owing little to anyone else – he does remember hearing someone named Tommy in Georgia, and heard Blind Lemon and Blind Blake on record. If there Is anyone to whom he owes allegiance, it is to Tampa Red (Hudson Whittaker), who he met in St. Augustine about 1926 – not so much for his style of guitar, but for encouragement. Typically, he started playing the guitar in “SevastopoI” tuning (open D or E) and fretting with a bottleneck – the expected “John Henry” was his first number – finally getting into standard tuning after moving to Florida. The harmonica was added around 1934 after watching a white performer work out with both instruments; he admits an influence on this instrument in the form of John Lee “Sonny Boy” Williamson (No. 1). Atlanta was “home” for Frank Edwards while he traveled – when in town he played with the “Star Band”, a black string-band of varied instrumentation . . . even going up to Tennessee with them. The band had guitars, a fiddle, bass, washboard, harp, as well as an occasional mandolin and even an occasional horn. Members included Georgia Slim, Ollie Griffin, Jonas Brown, and Leroy Dallas with Frank playing guitar, harp, sometimes washboard and even a fiddle! While out on the road he ran into the likes of Roosevelt Sykes, Memphis Minnie, Yank RacheIl, Robert Petway, and Tommy McClennan. It was this last pair who were responsible for Frank’s first recording session in 1941! They had met in Yazoo City just before Tommy was to go to Chicago and record for Victor . . . Frank went along, and McClennan’s manager, Lester Melrose, got him the Okeh session . . . with Washboard Sam backing him. Staying around Chicago for a while, he was exposed to Big Macao, Jazz Gillum, Memphis Slim, and Muddy Waters, playing with some of them as well. Traveling became the norm for some eighteen years – nearly annual trips to New York with Leroy Dallas in the 50s. . . a side jaunt to California before the war – always playlng his music. Frank started off riding freights, graduated to the buses and eventually had enough money to buy a car – he played fairs, juke joints, theatre talent contests, medicine shows, and carnivals with some success. After the war this dropped off, so he settled in Atlanta, meeting there locals like Blind Willie McTelI, Curley Weaver, and later Buddy Moss. It was Curley who was responsible for getting Frank back “on mike” again in 1949, and he backed him on the two sides cut for Regal that remained unissued until recently, presumably due to low commercial potential then. Since nothing came of this and the playing opportunities had tapered off by the mid-sixties, he stopped playing altogether, until recently. Frank Edwards was finally “uncovered” by researcher Pete Lowry the summer of 1972, much surprised that anyone was interested in the older music – quite bemused, in fact! Interviews were conducted, and all that sort of folkloric stuff, and he was queried aboul the possibility of doing some recording again. When he responded favorably it was arranged to return some months later for a start – in the meantime Chris Strachwitz (of Blues Classics and Arhoolie) had sent some royalties from two 1941 sides he had reissued . . . this was enough for Frank to buy a guitar and amp, and he started practicing and writing new material. There were problems when things got going in the summer of 1972, because Frank didn’t relish the idea of working all by himself. Much time was spent trying to find back-up musicians, but the hunt was not successful and the first session was done solo. Later on, Frank located a young guitarist playing one of the clubs in Underground Atlanta, with his rock/soul band, and he was used on the next session. Steve Carson is only 23, but he has good ears and follows very nicely and solidly (laying to rest the bit about time . . . actually everybody wanting to lead is more the difficulty – hell, Curley Weaver did just fine in ’49!) adding much to the overall sound. It was through the assistance of Roy Dunn (TRIX 4504) that “Popcorn“ was located . . . born Arthur Clover, he is a washboard player Roy remembered from Sandersville, and he was located there – his playing does not expose his seventy odd years. This was a vague attempt to repeat the feel of the ’41 session, and to get some more obvious rhythm into some numbers. Frank Edwards sounds like nobody else – he may play the harp and guitar together, but he sure as hell doesn’t sound like Jimmy Reed. He is as recognizable today as when he first recorded . . . he sounds just like Frank Edwards: and that’s it! What you have here is his first “immediate” release since 1941, and his first time in front of recording mikes in 23 years . . . listen! It is a shame it has taken so long for Frank to he recorded again, but it is good to hear him again in good form – this is no broken down old man, but an alive and vital blues artist. 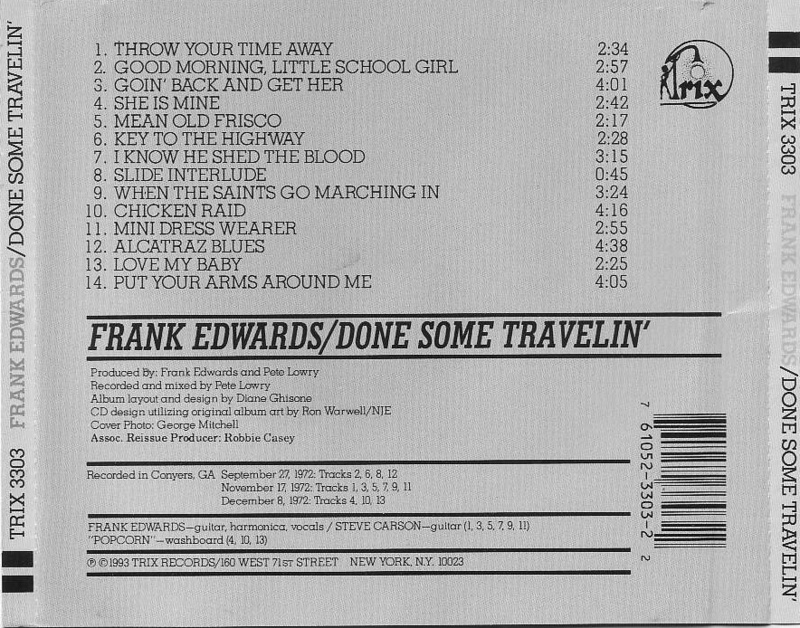 Frank Edwards still sounds like himself, which to me is a high recommendation. This is still (puzzlingly) his only full album, but there must be something good about it … it’s been bootlegged recently in Austria! He plays occasionally in clubs around Atlanta, or at a local festival once in a while. I remember a number of years ago taking Frank to a club in Atlanta (I think it was The Great Southeast Music Ha11) to see Muddy Waters. It was their first meeting since the 40s in Chicago. Muddy was so pleased and surprised to see Frank that he poured him a glass of champaign and they talked intensely between the sets and after the shows. His presence in Chicago at that time was noted by others, too. 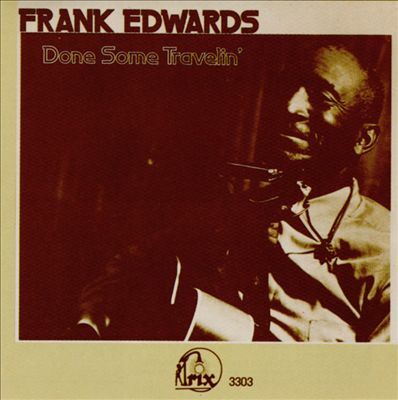 I gave a copy of this album to Homesick James (“Goin’ Back Home”; Trix 3315) around l974…he said, “My God, that’s Black Frank… haven’t seen him in years — where’s he at?” A gentle man and a good soul, Frank Edwards makes distinctive and high-quality music, as you will hear on this release. Frank Edwards was a taciturn man, one who kept much to his chest, and yet he was also a joy to be around. He spoke with very little lip movement, occasionally being hard to understand, but still generakky helpful. He did not share all he knew as we located folks that he could have directed us to, but that was OK – we never asked the right questions! He encouraged me to record his cross-the-street neighbor, Clifford Lee “Sam” Swanson (hca/gtr), and even played a few numbers with him . . . I do believe that there is a harp duet by them somewhere in my tapes! As I indicate in the above liner notes, his recording sessions took some doing to get started as I looked for some variety in his presentations and sound. A fine song writer and an unique player, Frank was uniquely Frank all the time, and none the worse for that. He came up to Chapel Hill in 1973 for the legendary concert series (backed by Billy Troiani on bass guitar) and George Mitchell used him in the Atlanta Down Home Blues concerts a few years later. I actually do not know how Frank made ends meet, but he always lived in decent houses and dressed well at all times. Frank’s later years were spent as a blues eminence gris for the blues of Atlanta. Known respectfully as “Mr. Frank”, he would show up at the club called Blind Willie’s where he had his seat from which he would watch the activities with his diet Coke! Tim Duffy and The Music Maker Relief Foundation in NC took on Frank and even recorded a few sessions, his first since the Trix efforts. The last session was in 2002, and Frank was being driven back to Atlanta from their NC location when he died in his sleep in the car March 22th outside Greenville, SC at the age of 93. Making music until the end! The fourteen pieces on this album were taken from four recording sessions, three done in 1972 at my Holiday Inn motel room in Conyers, GA (love that air conditioning! ), one at Frank’s home in Atlanta. For more on Frank Edwards, see “Oddenda & Such” #3 and #14.